Want to know what Facebook knows about you? Check our guide and find out! It is known that Facebook uses a lot of patterns to analyze and learn more about your online activity. This is done in order to build an advertising profile about you, which helps the Facebook advertisers display their ads based on your specific interests. On this guide, we have collected a few tips that will help you take a look at the information that has been gathered about your online activity and here we will show you how you can edit it. First, it collects all the information that you give it directly, such as your name, age, marital status, parental status, where you live, what you do for work, what your education is, etc. Second, it monitors what you do while you are on Facebook. This includes the stuff that you “like”, groups that you’ve joined, photos and links that you share, things that you click on, etc. And third, it may track what you do on the rest of the Internet when you are outside of Facebook, such as websites you visit and things that you search for through your search engine. Also, Facebook may read the cookies that other websites use in order to display ads both on its platform and on other web locations. If you want to have control over all these things, however, there are a few things you can customize and this is what we are going to share with you here. On the page that opens you will see a section called “Interests” with different sections. Each section represents a group of interests that Facebook organizes based on your interests and online activity. There may be many categories such as sports, news, entertainment, people, and business. To manage your data, all you have to do is go through these categories and if you see something is not relevant or you don’t want it to be listed, just remove it. This can be done if you click the “X” that appears in the upper-right corner of the item when you hover over it. Removing it should eliminate or at least reduce the ads you see, related to that content. When you are finished with customizing your “Interests” section, go down to the “Advertisers” section. There you will see a list of Facebook advertisers that already have your contact information. You can remove them again from the “X” button that pears when you hover the mouse and this should hide advertisements from these organizations or companies. 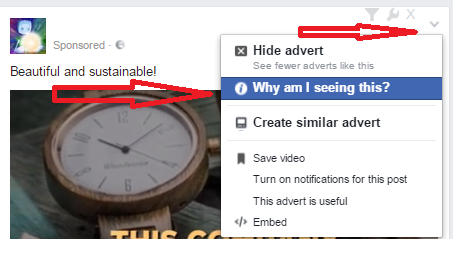 How to see fewer ads on your Facebook timeline? Another thing you can do if your timeline is really full of annoying advertisements is to click on the downward arrow in the upper-right corner of the ad as shown in the picture below. Then, select “Why am I seeing this?” and mark the ad accordingly. This should hide it or reduce the amount of advertisements of this type. Another annoying thing that Facebook does is it watching what you do outside of Facebook, again with the idea to show you ads. You can disable this activity by clicking on the Settings menu, then selecting Ads and turning the “Ads based on my use of websites and apps” OFF. Of course, this will not prevent Facebook from showing you just as many ads as before, but at least it will not be tracking your web activity. What do you think about the tips above? Are they helpful? What other ways to protect your privacy do you know? Feel free to share your thoughts in the comments below.